Over the next few months we will send you weekly emails to help you plan for your arrival to Ohio State. In the meantime, please explore our website , and you are always welcome to email us at iss@osu.edu . Have a wonderful summer and we look forward to meeting you this fall! Immigration Check-In registration will be available starting June 1. If you have any questions, please contact iss@osu.edu. Information about U.S. consulate policies, procedures, and requirements can be obtained from the U.S. Department of State. Applicants for student visas usually apply at the U.S. Embassy or Consulate in the country of their permanent residence. Click here for the list of websites for U.S. Embassies and Consulates. Although visa applicants may apply at any U.S. consular office, it may be more difficult to qualify for the visa outside the country of permanent residence. Visit oia.osu.edu for more information, or contact iss@osu.edu with questions. All new international students (including those returning from a leave of absence) are required to complete a health screening through Student Health Services. Complete the vaccination form to the best of your ability and have it verified by a medical provider before your arrival. Some vaccinations that are unavailable in certain countries are available in the United States and covered by your student health insurance. Visit shs.osu.edu for more information, or contact vaccination@osu.edu with questions. 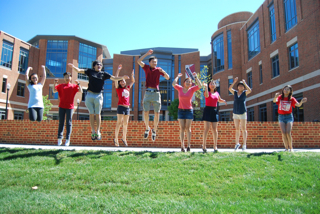 Join the New Ohio State International Students - Autumn 2018 Facebook group using your Ohio State email. The group will post about events happening during orientation, and you can meet and chat with your fellow new Buckeyes! Also like the Office of International Affairs and Global Engagement's Facebook pages to stay updated on events throughout the year. Chinese students can follow the China Gateway's WeChat for updates about Pre-Departure Orientation, traveling to the U.S. and activities here on campus! Follow the account by scanning the QR code. Visit our website to review information from previous emails and or answers to frequently asked questions. If you don't find what you're looking for, contact iss@osu.edu.